Just a really quick question: How often are shrimps supposed to shed? My cleaner sheds about once every three weeks. Do I take it that once the shrimp reaches its full size it will slow down? Complete, frequent shedding, moulting, ecdysis is common in younger shrimp species kept in good condition with decent nutrition, fair water quality, with as you speculate molt intervals increasing with size and age. I do want to note that folks should keep track of such behavior, and be on their guard if their shrimp no longer are molting period; as this may be indicative of a nutrient deficiency (including iodide-ate), and/or a misproportionality of biomineral and/or alkalinity make-up in their water. 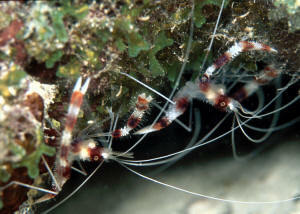 Further, Id state that one should leave such molts in the tank/system for reincorporation by the shrimp. Their shed exoskeletons will not pollute your water, and indeed are a useful source of material for making the new one. At the last, do remember that shortly after molting, your crustaceans are most susceptible to predation; make sure and provide them adequate cover, decor to hide in. I have a cleaner shrimp and an anemone shrimp and they shed their skin about once a month? Is it better to leave the skin in the tank or take them out. They seem to dissolve after about 2 days and I thought maybe the iodine goes back into the water. I did notice last time I did a water change with sea water the tank became very cloudy. The sea was very rough the day I collected it, is it a bacteria boom. I run 2 x 24w UV's so the tank water is turned over at least every 15 minutes. The reason I ask is that all the shrimps shed their skin the next night. Is that due to stress?